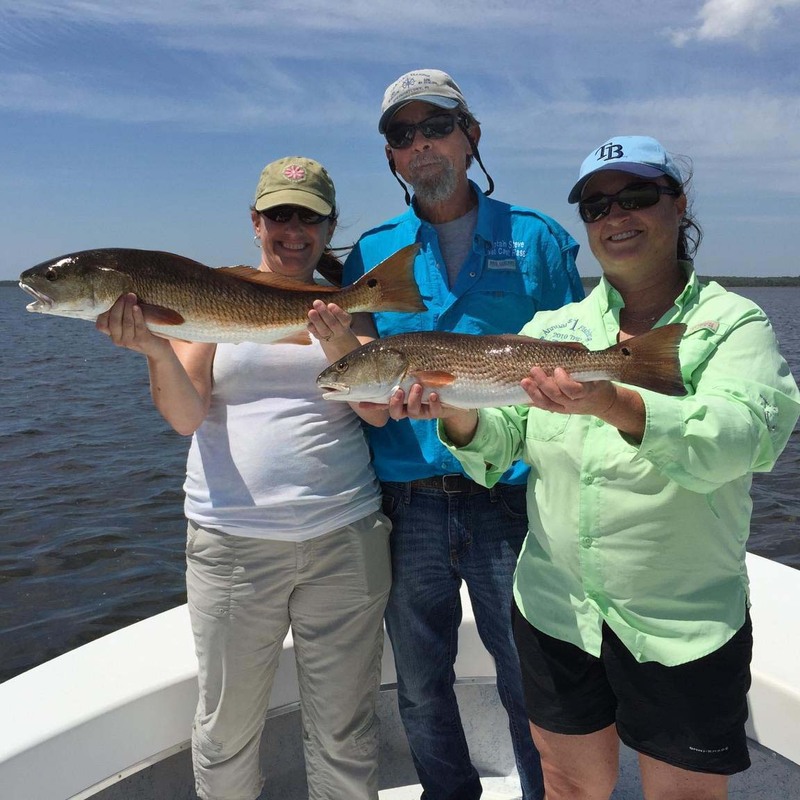 May has been a great month for trout, redfish and cobia. 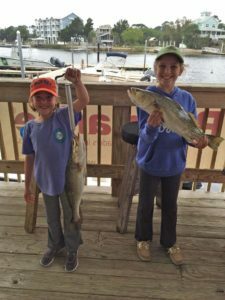 The whitebait have finally showed up in good numbers nearshore, and that’s where people have been finding large silver trout, keeper seatrout, Spanish mackerel, and lots of ladyfish and blue runners. 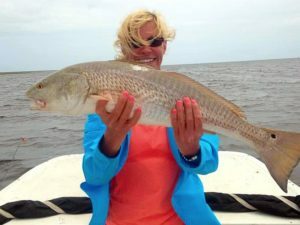 Redfish have been plentiful nearer the shoreline, especially on near-flood tides. 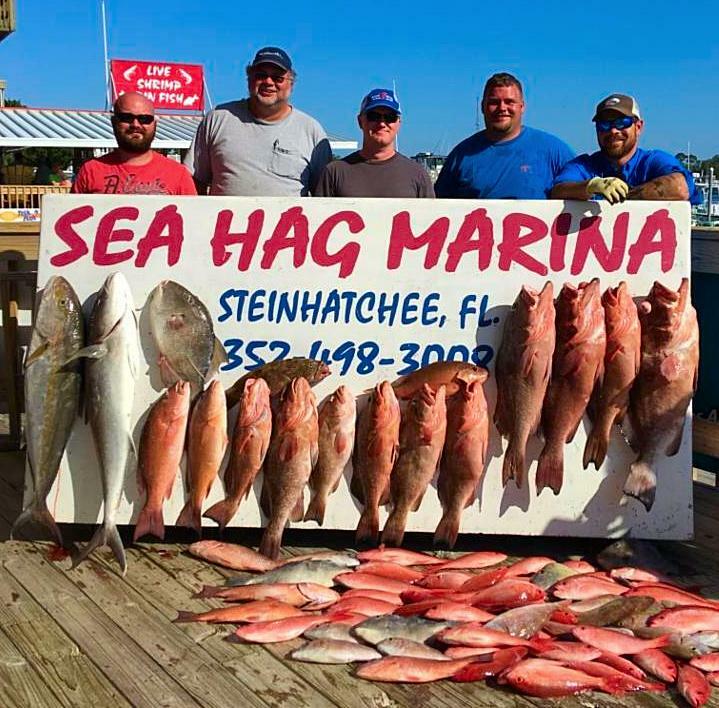 Offshore, kingfish and amberjacks have made up most of the catching; while gag grouper have been open in state waters, on June 1 they are available in federal waters as well. Flounder have been plentiful, though small, near sandbars and creeks. 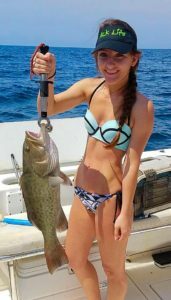 Here are some pictures of this month’s catches….and the first may be the surprise catch of the year. Tim Seese and Kyoho Lee were trolling for kingfish west of Little Bank in 30+ feet of water when they landed this beautiful sailfish. 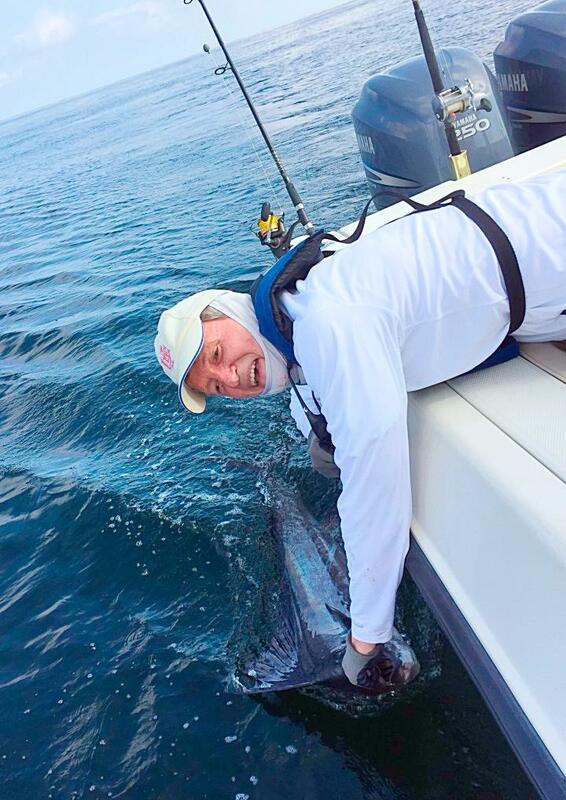 This is only the third sail I can remember that’s been caught in close waters, and it was a nice one. ….and here’s the photographic proof. 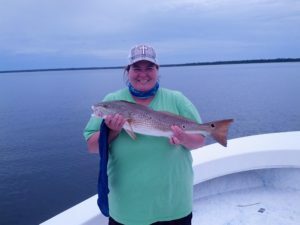 Billfishing in the Big Bend! Sabrina Bartelli with a gag grouper that had to be released last month….but not this month. Brooklynn Berger with her first trout! Max Leatherwood, trout specialist, with a large trout that he released. 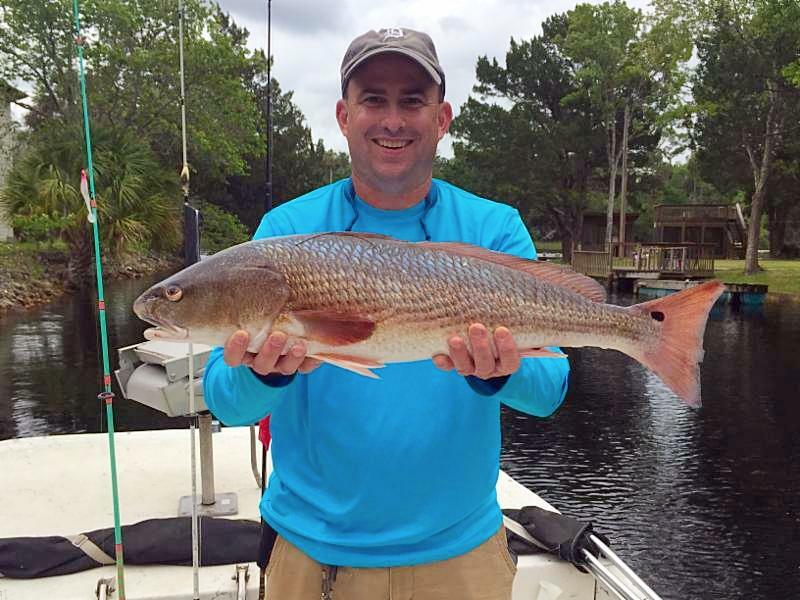 Bruce Abercrombie from Woodstock, Ga. caught this fine upper-slot redfish. 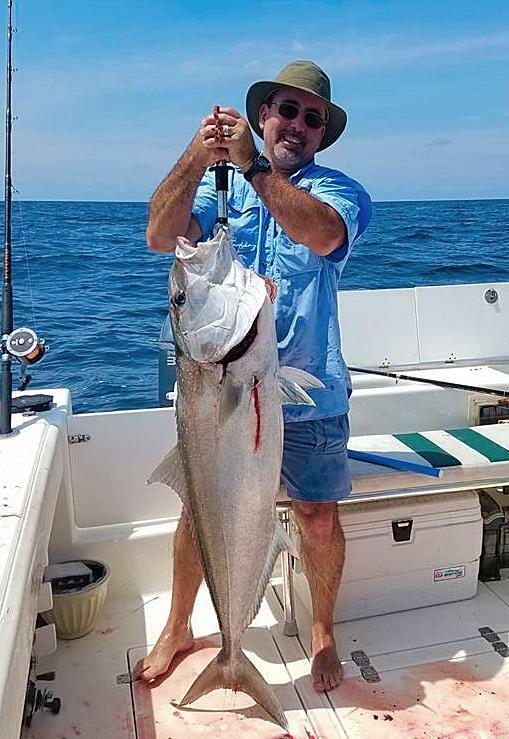 Rocky Motes with a huge amberjack. 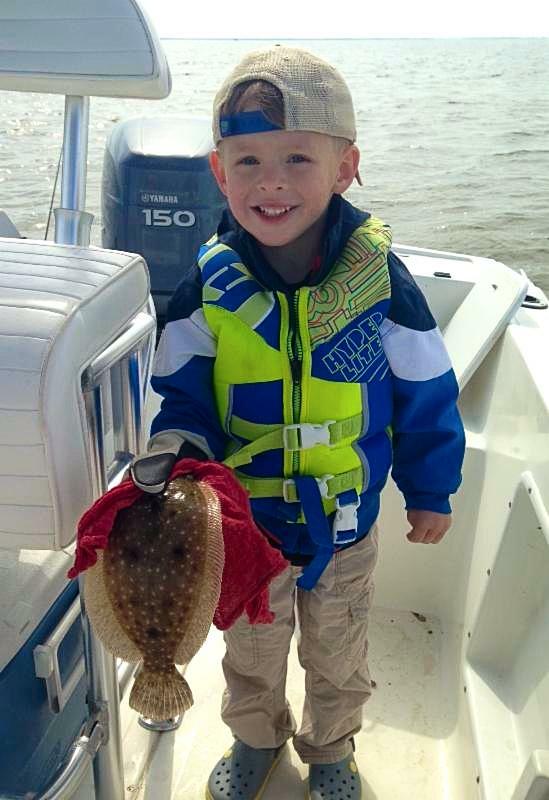 Cason Keen is excited about his flounder. Madison Cook with a very nice redfish. 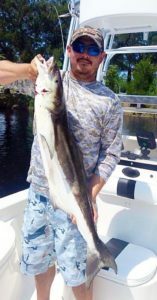 Chaeli Norwood fought this cobia for several hours on light tackle but lost him at the boat. 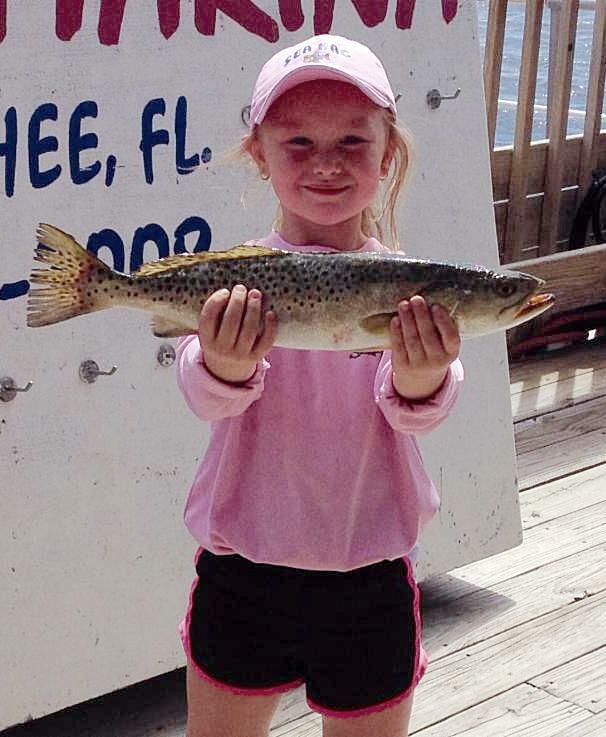 Maddy Fletcher with another Steinhatchee redfish. Chase Norwood speared this beautiful gag grouper on the Steinhatchee Reef, which is in state waters. 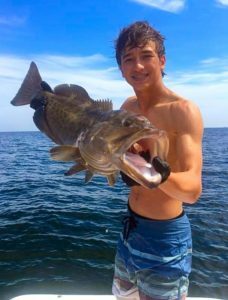 He saw lots of goliath grouper there as well. 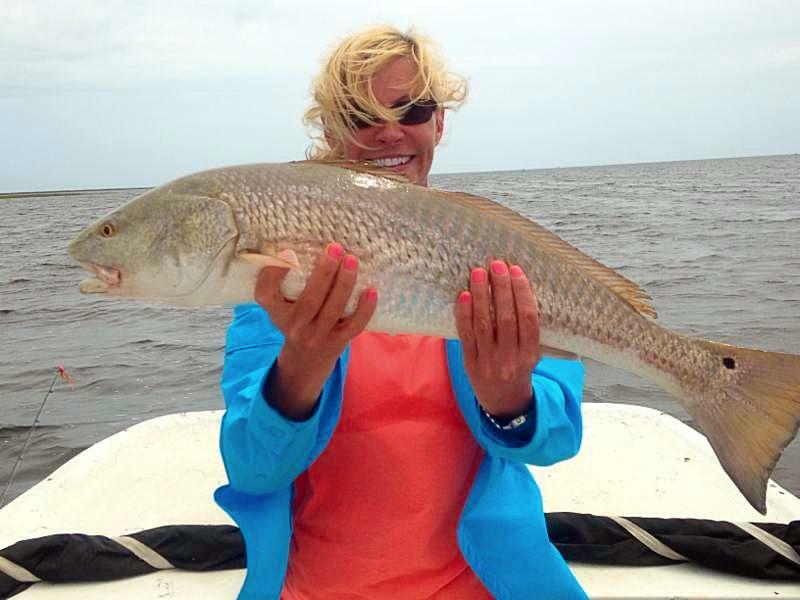 Lisa Marcotte from Canton, Ga with an overslot redfish that had to be released. Cheech Graham with a keeper cobia, one of many taken this month. 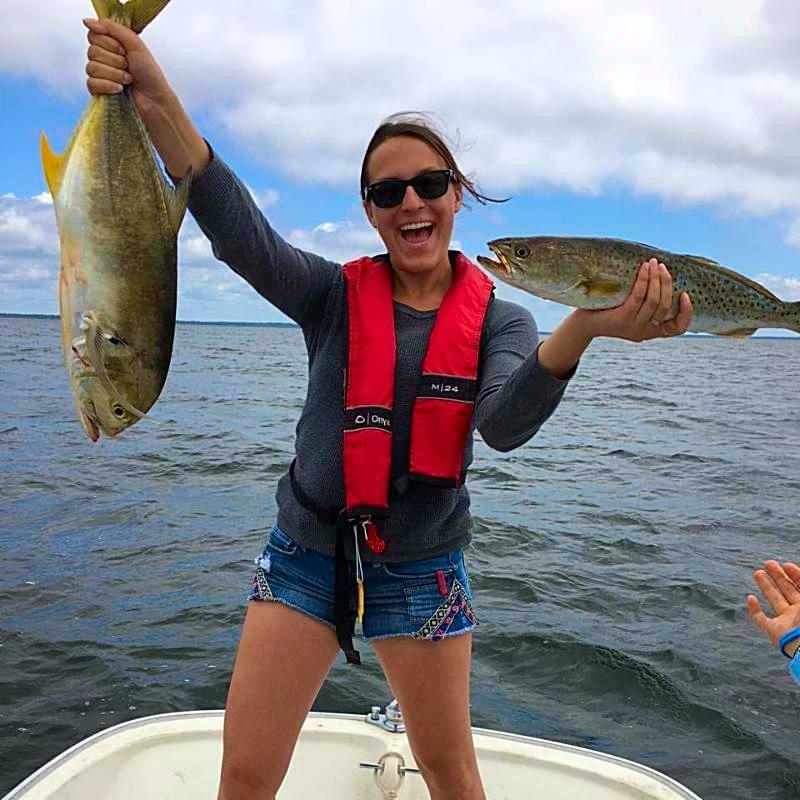 Laura Baird scored this large trout and larger jack crevalle, and was excited about it! Chaeli Norwood and Luke Matthews with a pair of schooling redfish. If you’re willing to go way way offshore, like the Corbett group, you’ll find lots of big red grouper, amberjacks, cobia and snapper. 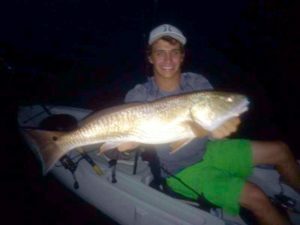 Brett Molzen went kayak fishing at night and found this overslot redfish. 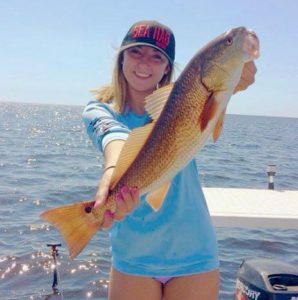 The ladies get their shot during the Nautigirls Tournament on June 11th, and there is a pro redfish series event on June 18th. 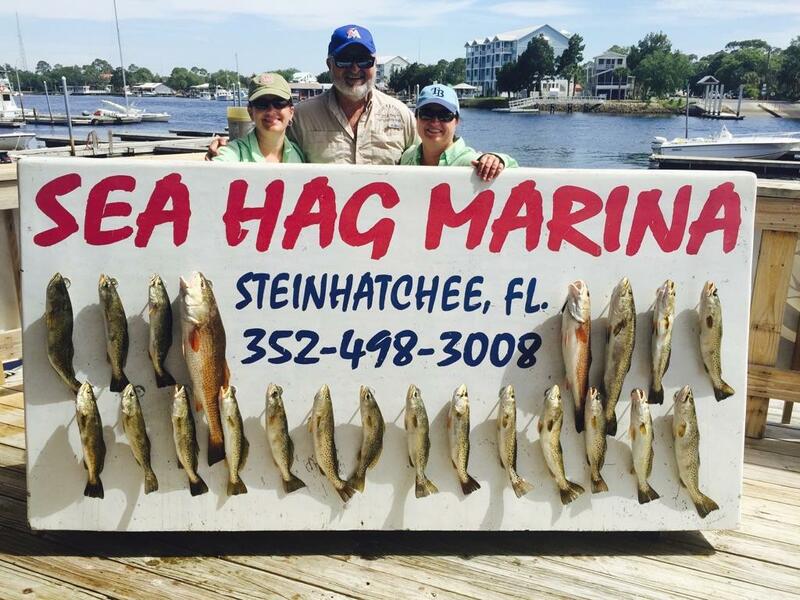 For more information, contact the ship’s store at Sea Hag Marina. As I mentioned earlier, gag group season opens June 1 in federal waters, with a size limit of 24”. 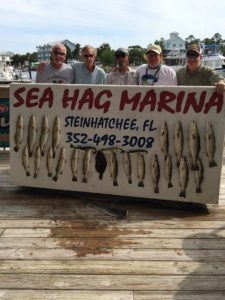 The grouper aggregate bag limit is four fish per person; 2 can be red grouper, 2 can be gags. Unfortunately amberjack are closed for two months. 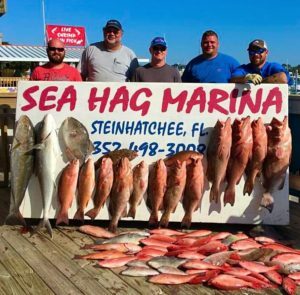 As usual, the recreational red snapper rules are complicated, but the first short season opens June 1-2 for recreational only, but June 1-16 with a charter captain. Inshore fishing will continue to be very productive. 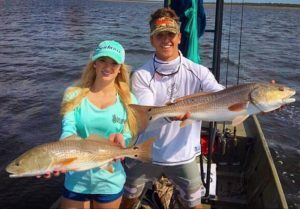 Redfish are schooling in near-shoreline areas and around inshore bars. Hot spots have been the shoreline between Dallus Creek and Fisherman’s Rest to the north, and Bird Island to Sink Creek to the south. 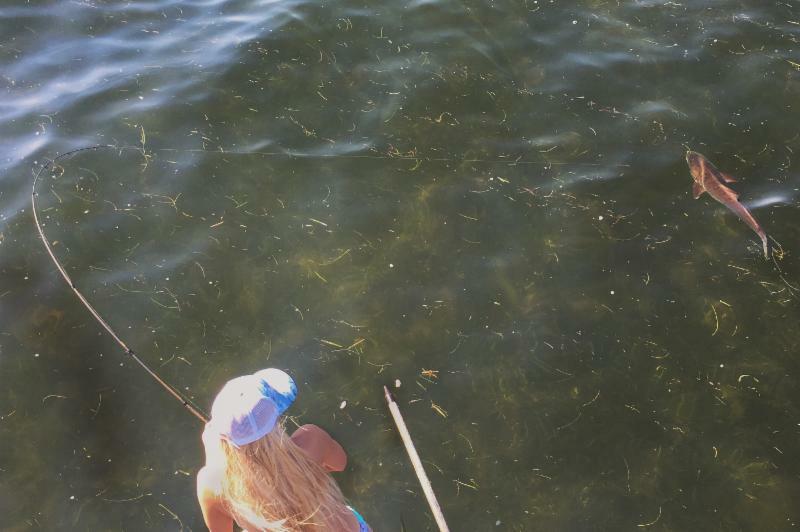 During the last week of May we saw a pretty strong influx of floating grass, so consider using jigs, popping corks, or cut bait instead of lures with treble hooks. 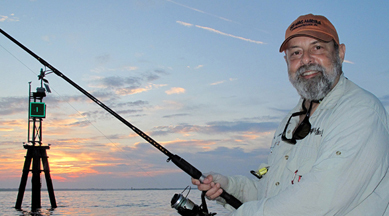 Another ticket is to use large soft plastics that are Texas-rigged to avoid the grass. Z-man Lures make a large floating shad and also a popping floating soft bait, and you can find a selection in the Sea Hag Ship’s Store. Any larger soft bait rigged without an exposed hook will be very useful in heavy grass, along with gold spoons. 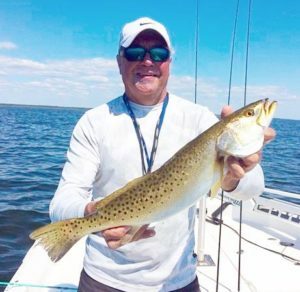 Trout have been caught around the nearshore bars, especially Little and 9 Mile Banks, west of the bird rack, and in the area toward Keaton known as doghead. These bars have been holding lots of white bait, and that’s the ticket. 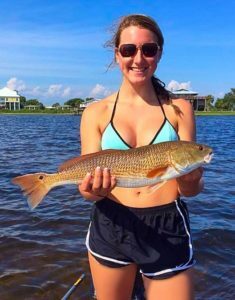 Find them and you’ll find the fish. 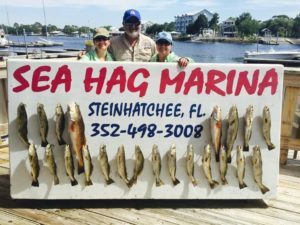 If you haven’t already, you need to make plans for accommodations and boat rentals at the Sea Hag Marina. Lodging is always a challenge during the season; some people renew their reservations every year, so don’t delay….call today. 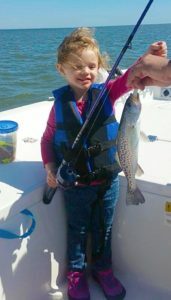 Trout fishing continues to be good both on the shallow grass and deeper holes. 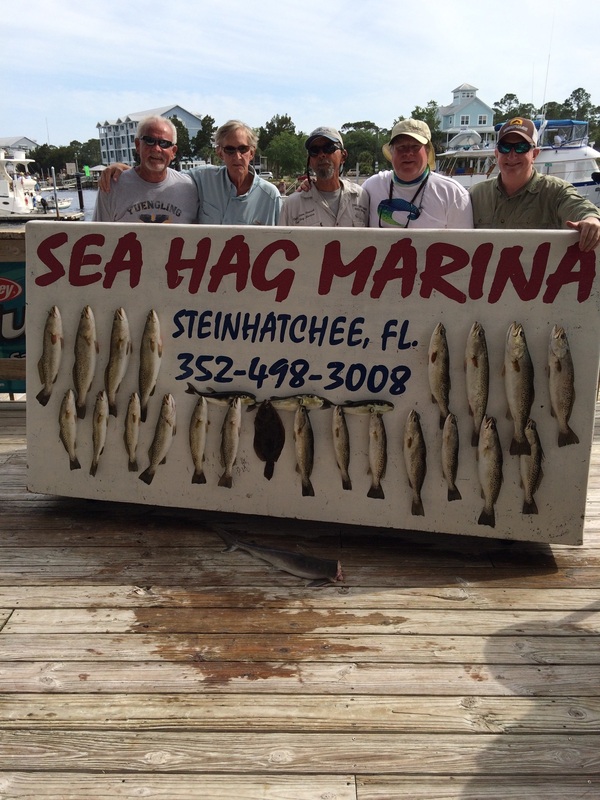 Sand trout are in the deeper holes and lots of Spanish around the sand bars. The bigger redfish are starting to move into the shallow grass around the creeks.